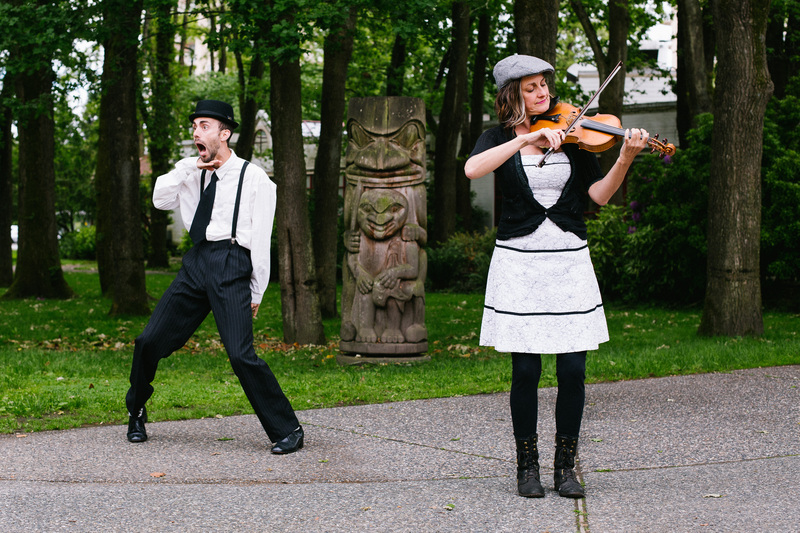 July 14-16, I’ll be making a fool of myself performing La End with Clara Rose in Victoria as part of SKAMpede. SKAMpede is a bike ride (or walk) along the beautiful Galloping Goose Trail with all sorts of site-specific short performances along the way! Check out Theatre SKAM’s website for more details, or their Facebook page for frequent updates. 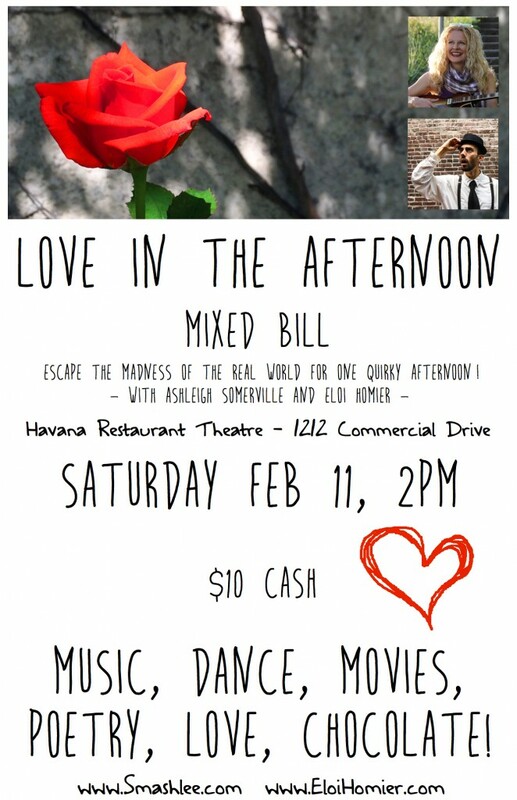 Come to the Havana Restaurant Theatre for an afternoon variety show, which will include two world premieres: Eloi Homier’s La End, and Ashleigh Somerville‘s Love Always Wins music video! We’ve been in rehearsal for La End over the past few weeks, planning for its first public showing on February 13th at Trout Lake Community Centre for Family Day. We will be adapting it as a roaming performance in the lobby between 12:00 and 12:40 PM. Please join in the fun, it’s FREE! I hear the place has been known to be pretty packed on that day in years past, so it will be a wild ride! Click here for more info and to register. Chances to show the full version of La End are in the works… stay tuned! La période de répétition s’achève en préparation pour la première présentation publique de La End. 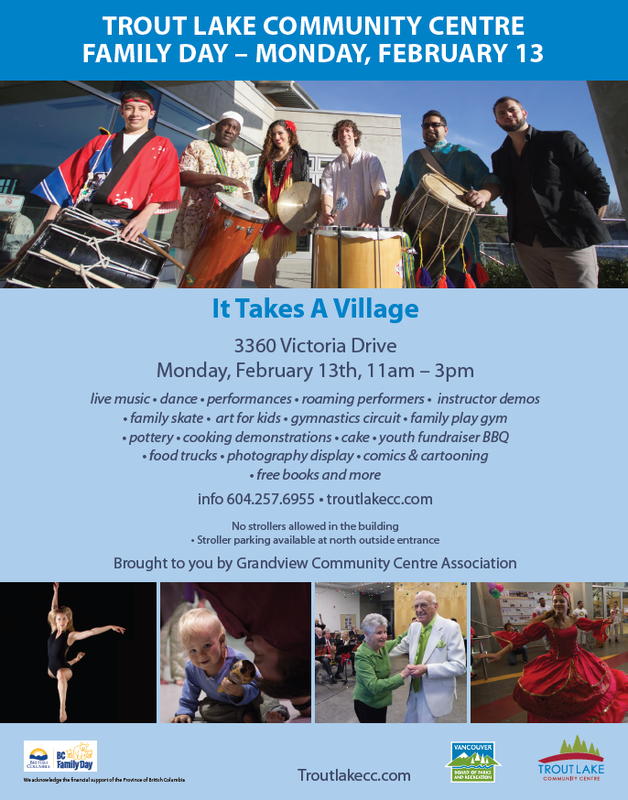 Le Centre Communautaire de Trout Lake nous a invité à venir présenter une version déambulatoire de La End dans le lobby pour leur programmation de Family Day. Nous nous présenterons le 13 février entre midi et 12h40 et c’est gratuit pour tous! Venez nous voir pour un extrait de la pièce complète, qui sera répété plusieurs fois dans l’heure. Cliquez ici pour davantage d’information. On travaille sur des possibilités de présenter la pièce complète à d’autres événements… revenez voir plus tard! Made in BC – Dance on Tour en partenariat avec le Conseil cultural et artistique francophone de la Colombie-Britannique on mit de l’avant un programme qui vise à aider les artistes de la danse francophone en milieu minoritaire à être diffusés dans des lieux inhabituels à travers la province. J’ai été invité à faire une soumission au programme Des arts dehors/Arts Outside – qui a été fait le 30 mai – et je suis en pleine création de ma pièce intitulé La End. Revenez sur mon site pour voir les détails du développement de ce projet! Made in BC – Dance on Tour in partnership with the Conseil culturel et artistique francophone de la Colombie-Britannique, have created an initiative for helping francophone dance artists book performances in unusual settings around BC. I have been asked to submit an application for the program, Des arts dehors/Arts Outside, and I am very excited to be in full-blown preparation of my piece! The application was submitted May 30th and I am looking forward to seeing where this opportunity might lead! Stay tuned for updates on the development of my piece, with the working title of La End. April and May were filled with amazing performance fun as I got to go once again on a school tour with V’ni Dansi and our full length dance and theatre piece, Cookin’ It Up Métis! It is always so rewarding to see the kids’ reactions and enthusiasm during our workshops and performances. It is a privilege to be able to positively impact thousands of young people’s lives with art. 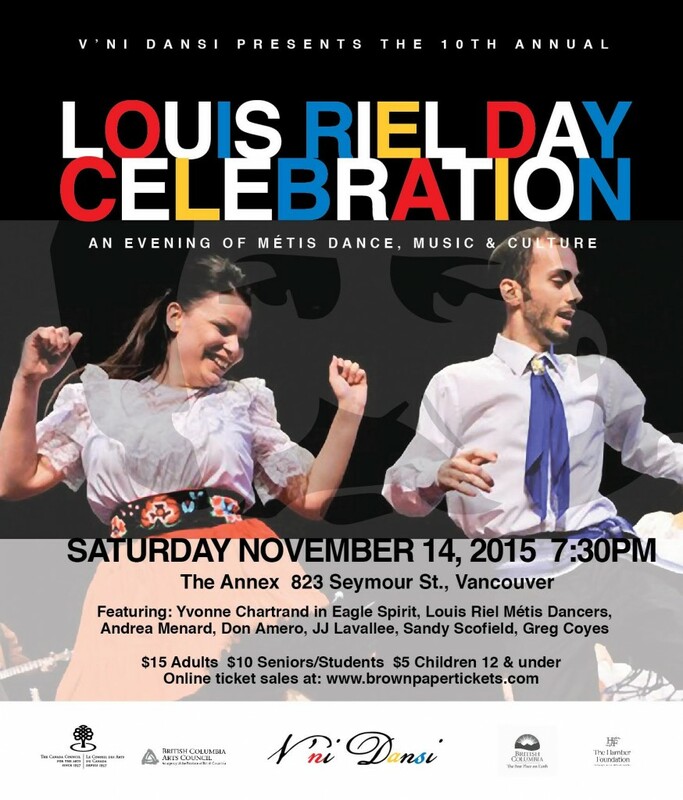 On Saturday November 14th I will be dancing in a couple jigging sets and a contemporary dance piece for the annual celebration of Louis Riel’s life. The contemporary dance piece will be an excerpt of The Crossing, a piece about Louis Riel, Gabriel Dumont, and the men and women involved in the battle of Fish Creek during the Northwest Resistance. You will also be entertained with some old time traditional jigs and an energetic contemporary jigging set! The evening of dance will be interspersed with lively Métis music and storytelling. Come join us at The Annex in Vancouver! More details here. 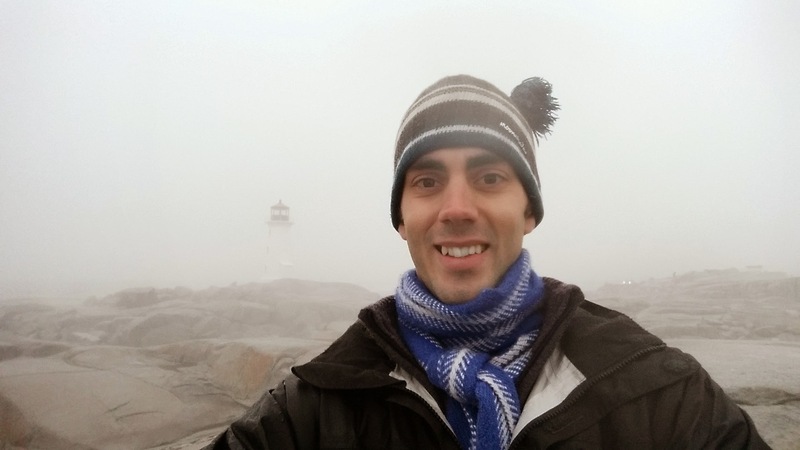 The past 9 months have been a whirlwind! I was invited to dance, mime, and act in Canada 300, a project by Watermark Theatre that toured to all 10 provinces and 3 territories. Canada 300 was a collection of 9 short plays done in French and English commissioned to 9 Canadian playwrights, with the goal of addressing our concerns for the future of our country. Ranging from environmental issues to racism, technology, and isolation, the plays raised questions with the hope of starting conversations in communities around the country. The project was artistically challenging and rewarding and the tour opened up my view of this huge piece of land we share! In September, I was invited to collaborate and perform in The House of Chow Mein, a multi-media performance piece about Honoré Jaxon and his brief time as Louis Riel’s secretary. 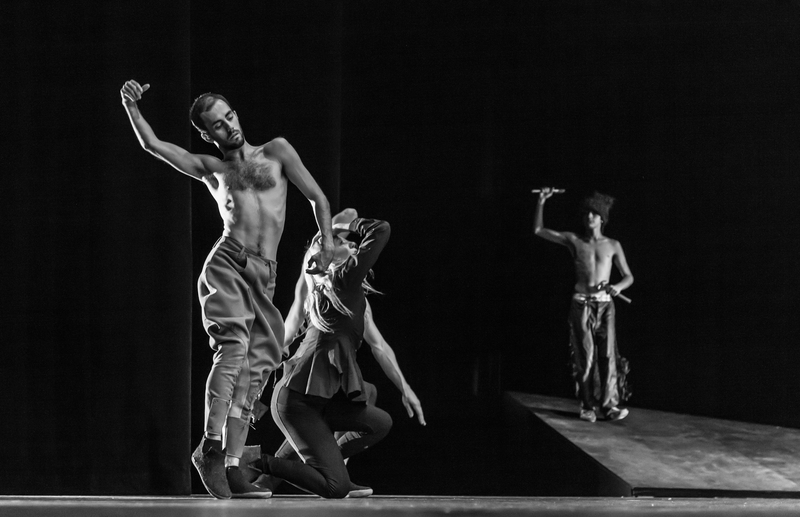 Conceived and directed by Edward Poitras and choreographed by Robin Poitras, The House of Chow Mein marked the opening of New Dance Horizons’ 30th anniversary season. I am currently working on Phase 3 of 20.20.20 as part of Dancers Dancing with choreographer Judith Garay. Working with so many amazingly talented dancers is super exhilarating! The project is inspired by the beautifully busy intersections of Vancouver! We will be rehearsing all summer and performances will run in the end of September. You can find a more thorough description as well as exact showtimes and location here. At the beginning of July I was lucky enough to participate in Dusk Dances, presented by Dancing on the Edge Festival. I danced the role of Tawano in Yvonne Chartrand’s choreography that told an excerpt of the Cree Creation Story; the telling of the beginning of time from the Cree perspective. I have to say I was definitely bit by the Dusk Dances bug. I would love to be a part of it again and next time I hope to present some of my own choreography! After a successful crowd-funding campaign, thanks to the generosity of my supporters and the amazing talent of the artists involved, our performance of 3 ways to kill a dancer was also a great success! See more about the show here. Après un levée de fonds qui a porté fruit, grâce à la générosité de mes supporteurs et au talent incroyable des artistes du spectacle, la représentation de 3 ways to kill a dancer fut un grand succès! Vous pouvez en voir plus sur le spectacle ici.